I had completely forgotten that I was due another Foodie Exchange package, so it was a lovely surprise when Mardi’s parcel popped up on my doorstep last week. 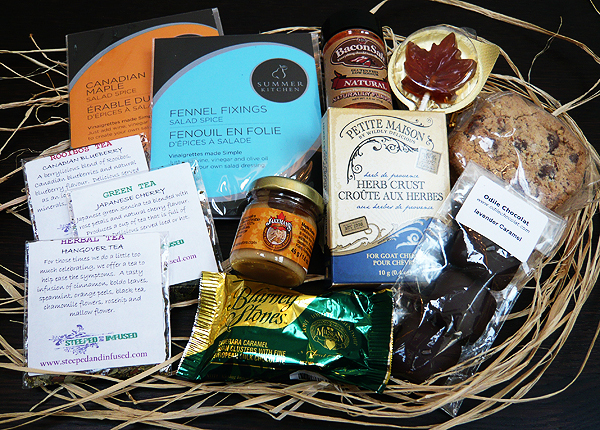 Flown all the way from Toronto, it was stuffed with fabulous Canadian treats and Mardi (from the blog Eat.Live.Travel.Write.) had clearly put loads of thought into the selection. The first thing to catch my eye were the intriguing Lavender Caramels which didn’t ooze caramel when bitten into (as I had imagined), but instead the dark lavender scented chocolate covered a crumbly sugar centre. The lavender wasn’t overwhelming but was definitely present – very unusual…but delicious! The Maple Caramel Pecan Clusters on the other hand were full of soft gooey caramel – the wonderful kind that makes your teeth stick together. And the cookies were buttery and crunchy, with really creamy chocolate chips. Yum. ~ by gourmettraveller on March 9, 2010. Hi. I just came across you blog. Really like it.